DIE Mercurii, videlicet, 20 die Aprilis. Inigo Jones to be heard. Alice King, 5l. out of the Contribution for Irish Poor. Turner to attend about Webb's Cause against Bishop of Landaff. Committee to prepare Heads for the Conference on the Declaration against those who procure Petitions against the Militia. Mr. Clarke, Curate of Stisted, recommended for the Living, the Minister being dead. The House to be called Tomorrow. Ordered, That the Cause upon an Impeachment brought up from the House of Commons against Inigo Jones, Esquire, touching the pulling down of St. Gregorie's Church, shall be heard here at this Bar, on Tuesday next, being the 26th of this Instant April; and that the Parties therein concerned are to have Notice, that they may attend the Hearing accordingly. 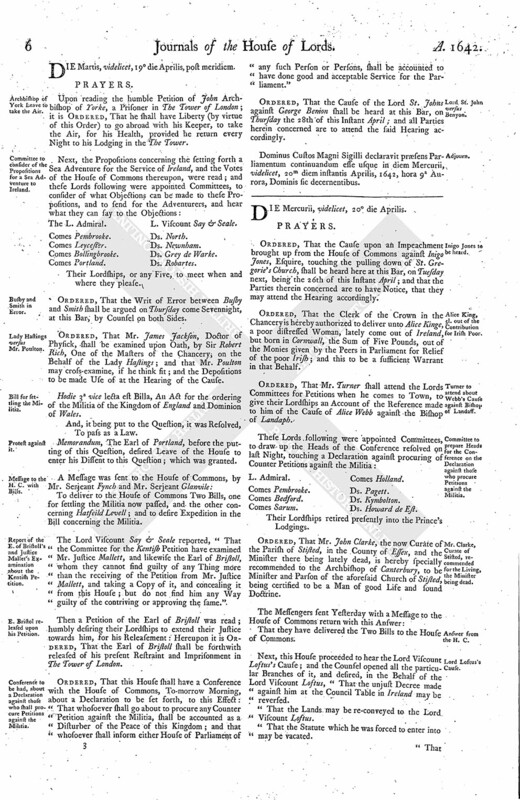 Ordered, That the Clerk of the Crown in the Chancery is hereby authorized to deliver unto Alice Kinge, a poor distressed Woman, lately come out of Ireland, but born in Cornwall, the Sum of Five Pounds, out of the Monies given by the Peers in Parliament for Relief of the poor Irish; and this to be a sufficient Warrant in that Behalf. Ordered, That Mr. Turner shall attend the Lords Committees for Petitions when he comes to Town, to give their Lordships an Account of the Reference made to him of the Cause of Alice Webb against the Bishop of Landaph. Their Lordships retired presently into the Prince's Lodgings. Ordered, That Mr. John Clarke, the now Curate of the Parish of Stisted, in the County of Essex, and the Minister there being lately dead, is hereby specially recommended to the Archbishop of Canterbury, to be Minister and Parson of the aforesaid Church of Stisted, being certified to be a Man of good Life and found Doctrine. That they have delivered the Two Bills to the House of Commons. Next, this House proceeded to hear the Lord Viscount Loftus's Cause; and the Counsel opened all the particular Branches of it, and desired, in the Behalf of the Lord Viscount Loftus, "That the unjust Decree made against him at the Council Table in Ireland may be reversed. "That the Lands may be re-conveyed to the Lord Viscount Loftus. "That the Statute which he was forced to enter into may be vacated. "That the Monies which came to the Use of Sir George Wenthworth's Hands, received by Sir Paul Davys, may be paid to the Lord Viscount Loftus. "And that the Writings and Evidences may be delivered up to his Lordship." Then Mr. Parsons, of Counsel for Sir Adam Loftus, Sir Phillip Manwaringe, and Sir Paul Davys, made this Answer for them: "That their Names were used but in Trust, and they never executed any Thing concerning this Business, and are ready to do whatsoever their Lordships in their Judgements shall think fit for them to do." 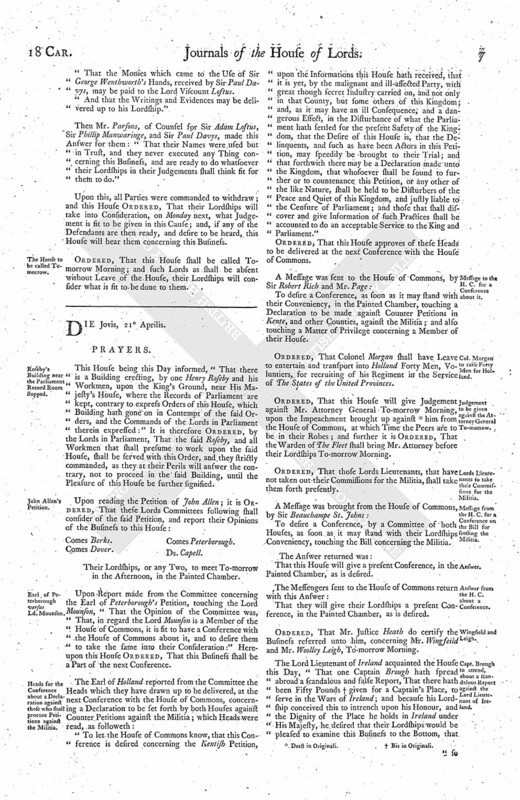 Upon this, all Parties were commanded to withdraw; and this House Ordered, That their Lordships will take into Consideration, on Monday next, what Judgement is fit to be given in this Cause; and, if any of the Defendants are then ready, and desire to be heard, this House will hear them concerning this Business. Ordered, That this House shall be called Tomorrow Morning; and such Lords as shall be absent without Leave of the House, their Lordships will consider what is fit to be done to them.